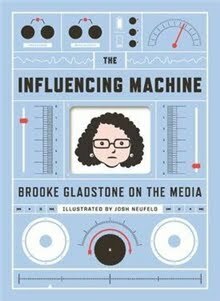 Brooke Gladstone’s The Influencing Machine is a non-fiction comic about the media. The book’s structure owes much to Scott McCloud’s Understanding Comics: a cartoon version of Gladstone herself addresses readers directly and guides them on a journey through the history of journalism (mostly US-focused, but still of interest to this European reader), culminating in a discussion of the many issues surrounding the media in the present day. This is a structure that I find really effective for graphic non-fiction, so it’s exciting to find another book that makes such good use of it. The title The Influencing Machine is a reference to a syndrome identified among schizophrenic patients by Victor Tausk: all these patients believed they were being controlled by an external entity. Over the course of The Influencing Machine, Gladstone challenges the notion that the media are an external entity outside of our control. As she states in the introduction, “the media machine is a delusion”; what we’re dealing with is better describe as “a whole mess of mirrors”. Of course, the fact that there’s no unified media conspiracy doesn’t mean that the media don’t manipulate or mislead people. It’s just that, first of all, we’re not helpless or passive consumers; secondly, the most common media biases are not what most of us would guess. 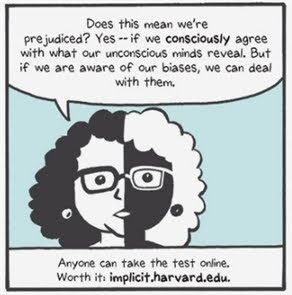 We tend to be hyperaware of political bias, but Gladstone explains why she thinks that what we should really be worried about is commercial bias, bad news bias, status quo bias, access bias, visual bias, fairness bias, and narrative bias. Gladstone also devotes a considerable amount of space to exploring the full implications of living in an increasingly participatory media culture. Although we have always filtered our media exposure, the Web makes it much easier for any of us to completely shape our media landscape. As attractive as the prospect may be, there are some dangers we need to be aware of. The term “incestuous amplification”, for example, refers to an unjustified sense of certainty developed in an “echo chamber” where there’s nothing but constant agreement and repetition of the same ideas. Being challenged and exposed to different ideas helps us all developed our worldview, and it’s a great way to prevent extremism or the demonisation of our opponents. The good news, however, is that a participatory culture also gives us the chance to “choose how much to simplify our worldview”. Media consumption is not passive, which means we’re not doomed to create echo chambers. We can decide to seek out alternative points of view at any time. As I mentioned last week, I really liked Gladstone’s presentation of Daniel Hallin’s doughnut analogy, according to which journalism can operate in three spheres: there’s the sphere of consensus (the doughnut hole), the sphere of legitimate controversy (the actual doughnut), and the sphere of deviance (the air around the doughnut). Journalistic debate mostly takes place in the second sphere, but it’s useful to remember that since what we understand as unquestionable values and absolute truths changes over time, some of the topics that current fall in the unspeakable air around the doughnut will one day be brought into the sphere of legitimacy. The doughnut analogy also helps us realise how what we understand as political bias (or simply political engagement) changes over time. The idea that women should be able to vote currently falls in the sphere of consensus in many parts of the world, for example, but only a hundred years ago it was still being dragged from the sphere of deviance to the sphere of legitimate debate. In addition to finding The Influencing Machine extremely interesting on a personal level, I thought there was much here that was incredibly useful to bloggers of any kind. I’m a small-potatoes blogger whose readership doesn’t even come close to that of any commercially viable traditional media outlet, but many of Gladstone’s ideas still resonated with my experiences as someone who creates content that is consumed by others, no matter on what scale. For example, she touches on the transition from a kind of journalism focused on the idea of objectivity to the current focus on transparency and disclosure (which is not without its pitfalls). Many of these ideas are relevant to debates that have raged in the blogging world in the past – as well as to the most recent instalment of the periodically reoccurring discussion about blog reviews, professional reviews, and the idea of objectivity. Similarly, the chapter titled “The Matrix in Me”, which focuses on how easy it is to be affected by unconscious biases and prejudices, will be of great interest to anyone whose writing is made public (as well as to any media consumer, of course). Everything we hate about the media today was present at its creation: its corrupt or craven practitioners, its easy manipulation by the powerful, its capacity for propagating lies, its penchant for amplifying rage. Also present was everything we admire—and require—from the media: factual information, penetrating analysis, probing investigation, truth spoken to power. Now and always, we have the power to become informed media consumers, and also the power to be conscious, deliberate media-shapers. Another incredibly fascinating book I'd never heard of until you introduced it to me! I'm so glad you liked this—I thought this would be something you enjoy. And it's good for me to reconsider Gladstone's parting words. It's so easy to feel like we don't have agency against big institutions like the media, but we do, and it's important that we don't give up. This sounds fascinating! I think it's important for us to be informed media consumers - I know people who will complain about what's on TV and when I tell them to turn it off, they always give me a funny look. I am so happy that you enjoyed this! The Influencing Machine is such a fascinating book. It's a book that once you read it, you immediately want to re-read it. Especially relevant in the UK right now with the Levenson Inquiry and phone tapping. Fascinating. It always astounds me at how quickly the public accepts as truth anything that this touted by the mass media. It's always important to stay aware. Clare: Yes! I thought that was a really powerful way to finish the book. Kathy: Or don't even turn it off, but make sure that's not your sole source of information. Vasilly: It's one I'll be coming back to for sure. Jodie: Her tone isn't finger-pointy at all, which I really appreciated, but at the same time it's pretty impossible to put this book down and not think about how sketchy newspapers go that far because there IS an appetite for that sort of thing and they know it - and over a long period of time we've rewarded unethical behaviour with our money. Beth F: There's a fascinating section on fact checking, and how pieces of information that were pretty much made up are endlessly spread by people who quote one another in a loop. This is a perfect example of how graphic novels are serious stuff. I am off to see if I can get my hands on it. This sounds fantastic and like something I probably need to read! It's the sort of topic I could stand to read and know more about. This sounds like a fantastic read. I've never read graphic non-fiction before, and I think this is a great first book in this category for me. Funny to read about this book right now - my eight y.o. recently discovered Garfield, both books and tv episodes, and just last week, was howling over an episode titled "If you heard it on TV, it must be true". I think there is virtually no way for one to be totally unaffected by the media, though some may really try. Having kids really influenced me about this topic, as I have tried to raise them without the influences of the media that they are constantly surrounded by, but it can be hard at times. We pretty much don't ever turn on the T.V. at our house, and that's something that the kids don't object to, but what they see in other places does indeed affect them. This was an incredible review today, Ana, and I would really like to read this one and see where I fall in the spectrum. It's interesting to know that the biases in media aren't what you'd expect - I'd never heard of most of the ones you mentioned and am intrigued! I think I should remember more often that the news isn't objective. I like the doughnut idea too. It sounds like a fascinating book. This really does sound fascinating. I've often pondered how "real" things are and how much is based on things that the media is telling us. I've definitely got to read this book and would love for my son to read it too! I actually bought this for someone for Christmas -- now I have to wait and see if I can borrow it. It sounds so smart! I love the doughnut analogy. I wish everyone who consumed media was actually aware of how it's filtered to them. I have to admit that when you introduced this, I was a little skeptical. 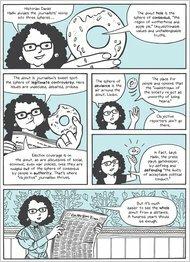 A graphic novel about the media? Hmmm. But you make it sound so interesting! I'm definitely looking forward to reading this. I first read about this at Natasha's blog. I really like the illustrations--reminds me of the simple yet impactful illustrations of Satrapi. Have my eye out for this one! This sounds excellent. Thank you for the recommendation! Wow, I must have missed Vasilly's review of this one. 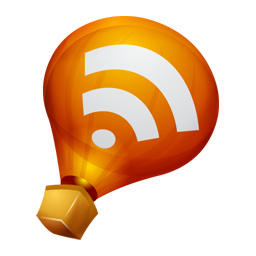 Sounds like powerful stuff, and I like how you relate it back to blogging.